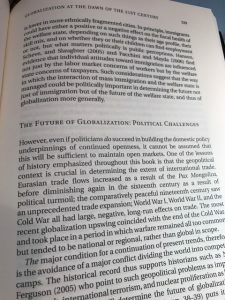 It’s no easy task to write a reasonably concise (about 200 pp), highly readable, well-informed synopsis of the big trends in global economic history, along with an assessment of how these are likely to play out in the near future. 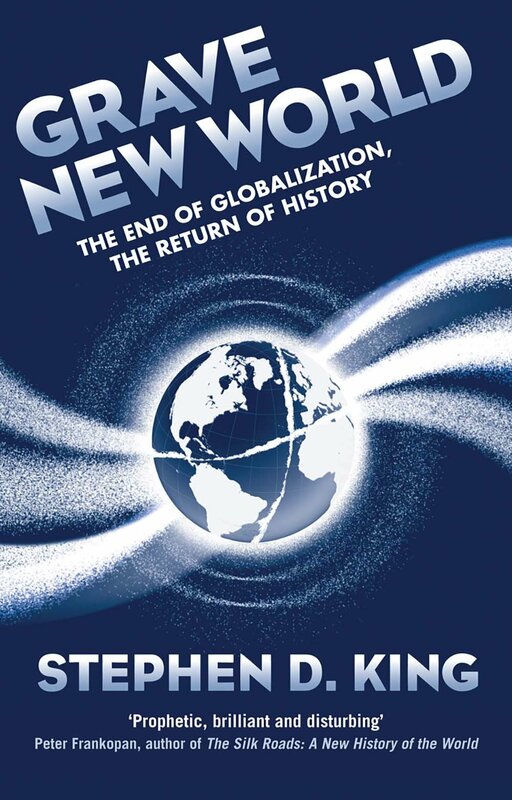 Stephen King, HSBC’s Senior Economic Adviser, has given us such a book in Grave New World: The End of Globalization and the Return of History. As the title indicates, it isn’t an optimistic book. But more of that in a moment. The book starts with an extract from a speech by Joseph Chamberlain as Secretary of State for the Colonies in 1897. It was an ‘end of history’ speech: in ruling the Empire, he sdai, “[W]e are fulfilling what I believe to be our national mission, and we are finding scope for the exercise of those faculties and qualities which have made us a great governing race….” The Introduction segues into the inevitability that empires that rise subsequently fall. The Whig interpretation of history is still wrong. 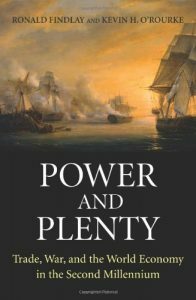 The remainder of the book is similarly ambitious and wide-ranging, although consequently covering vast events in a page or two; this can inevitably feel breathless. But this is a worthwhile price to pay for the breadth of reference. For instance, few books by financial market economists about global trends manage to include reference to the work of development economist Arthur Lewis (although I’d like to mildly complain that he’s referred to here as the first black academic at the LSE; he was the first black professor appointed in the UK, and that was by the University of Manchester, where my office is in the Arthur Lewis Building). The other merit of a wide-ranging book of course is that you learn some things you didn’t know. For me, it was the detail about China’s extension of its economic and political reach in Asia and beyond. For all that China’s path will be turbulent (see Martin Wolf in the FT today), there can be no doubt about where the centre of gravity of the world economy is moving. The final part of Grave New World is titled ‘Globalization in Crisis’. It describes the multiple weaknesses of existing global institutions but concludes there’s nothing better around than sticking with, and improving, the WTO, the EU, NATO etc. I think one has to forgive the un-stirring conclusion – I certainly have no better ideas, although in glum moments (there are may, watching the news) I rather fear that events in the near future will destroy the existing institutional landscape leaving no option but to go back to the drawing board. The book ends even more pessimistically than me, however, with an imagined Ivanka Trump Inauguration speech in 2044. Oh my, history is definitely baaack. 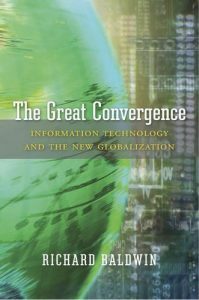 I’ve managed to resist reviewing Richard Baldwin’s new book The Great Convergence: information technology, trade and the new globalization until now, and it has taken serious self-restraint as the book is so relevant to (among other things) the Brexit debate. I would for one thing force every Cabinet member to read it and not allow them to keep their jobs unless they could pass an exam based on it. Anyway, the book’s published on 14th November and now it’s November my self-denying ordinance can end. The Great Convergence offers a compelling framework for thinking about how trade is organized and why and how it benefits whom. The first part is a historical overview of trade leading up to the first, the Old Globalization or the 19th century. This phenomenon, due to steam power reducing trading costs, industrialization and a context of relative global peace led to the Great Divergence: the major economies of Asia, which had been richer than the West, fell behind, dramatically so over the course of two centuries. The New Globalization, since the 1980s, driven by the new information and communication technologies, has taken the rich countries’ share of global output back to its 1914 level in little over two decades. China is the standout story, going from uncompetitive in 1970 to 2nd biggest in the world by 2010, but other rapidly industrializing nations in the New Globalization are Korea, India, Poland, Indonesia and Thailand (ie. a different group from the notorious BRICs). 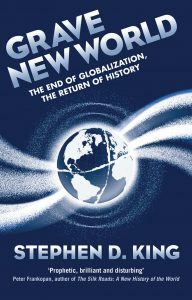 However, as the book goes on to document, the New Globalization is a completely different kind. Trade over distance has three costs: the costs of moving goods, ideas and people. When moving goods got cheap, the first explosion of trade occurred, but ideas were costly to move so the innovations of the industrial revolution were not easily exported. The Old Globalization was the result of low shipping costs and high communication costs. ICTs have reduced the latter significantly, so industrial competitiveness is defined in terms of production networks, interlinked supply chains, that cross national borders. Knowledge has been offshored, and the rapid growth in a few previously poorer countries has come about because of their geographical location, close enough to G7 industrial centres that managers can travel there, sharing knowledge within the confines of the production network. This means the New Globalization happens at the level of stages of production and occupations. This makes it harder to predict who will be affected – which jobs will be offshored, which areas most affected. “Nations are no longer the only natural unit of analysis”. Much of the book describes a new data set making it possible for economists to begin to explore the ‘value added’ pattern of trade created by the switch from trading finished goods toward trading components in global production chains. The picture is going to be utterly different – the famous example being the iPhone which is sourced conventionally as a Chinese export to the US but where the value added is concentrated in the American business and the Chinese import a lot of the components they assemble and re-export with not much value added at that stage. This is one insight the Brexiteers need to appreciate, although the Nissan letter suggests at least some members of the government realise the signficance. British businesses are woven into supply chains with our near neighbours: we aren’t importing prosecco and salami so much as gear boxes. Brexit threatens to tear apart these links. If the cost appears to be too high, the multinationals at the head of the supply chains will relocate chunks of their production networks, and won’t care if they’re exporting gear boxes to the Czech Republic rather than Britain. 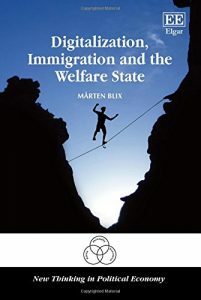 The book adds: “Twenty-first century supply chains involve the whole trade-investment-service-intellectual property nexus, since bringing high quality, competitively priced goods to customers in a timely manner requires international coordination of production facilities via the continuous two-way flow of goods, people, ideas and investments. Threats to any of these flows become barriers to global value chain participation…” Baldwin adds that the movement of people is still a binding constraint on globalization, and face-to-face communication – and so distance – remain important. He argues that the improving quality of telepresence is changing this, but I think that remains to be seen. Ultimately, trade policy today is not just about trade nor about nations. It involves deploying the nation’s productive resources through overseas connections. This is why 90% of the economics profession thought, and thinks, Brexit so damaging, and the idea that the UK has more economic self-determination outside the EU a delusion. The Great Convergence is not about Brexit – it ranges far wider. I can’t imagine a better and more accessible analysis of trade and globalization in the digital era. I finished reading Sven Beckert’s prize-winning Empire of Cotton: A new history of global capitalism in Cottonopolis, aka Manchester. I grew up in Lancashire in a family many of whose members worked in the cotton mills. The noise and hot greasy, dusty smell of the mills was part of my childhood. At school we were taught that we had been the cradle of the Industrial Revolution: John Kay, Richard Arkwright, Samuel Crompton, created their inventions just down the road. In Lincoln Square in Manchester stands a statue of Abraham Lincoln, a recognition of the support Lancashire mill workers had given to the Union side in the American Civil War, even though the blockade of southern ports created the ‘cotton famine’ that was the source of the great hardship they were experiencing. Not surprisingly, I’ve been immensely looking forward to reading Empire of Cotton, saving it as a treat. And although I enjoyed reading it, it also left me very uneasy. The book wraps a huge amount of fascinating detail and insight around a single unwavering theme: that ‘war capitalism’, the violence of empire and slavery and thus the creation of a global trade with protected markets, made possible industrial capitalism. Now, I’m no imperialist, and there’s no question about the horrors of the slave trade – and the riches it created in the UK. David Olusoga’s recent BBC TV series about the UCL project on the legacy of British slave ownership highlighted the foundational importance of slavery for the UK’s 19th century prosperity, despite abolition. Even so, I distrusted the book. In 441 pages of great detail, was there really no room to mention those Lancashire mill hands? It isn’t an unknown story: Radio 4’s In Our Time had a fabulous episode on it earlier this year. Yet the book’s chapter on the cotton famine speaks only of ‘Manchester’ as a solo voice and its concern about the Union blockade. Life – and history – are more complicated than a Rosa Luxemburg-like frame with no room for anything that clouds the simplicity of an argument. 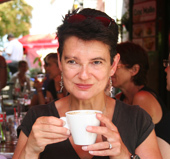 But this is – well, more than a quibble, just not enough to have stopped me enjoying the book. Three points were particularly interesting. First was the analysis of the interaction between the labour-intensive upstream production and the capital-intensive downstream production, and how the technological practicalities shaped the organisation of processing, manufacture and trade. 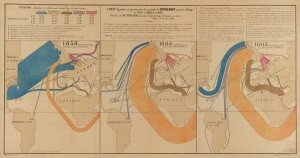 Although cotton is probably now the lowest profile industry of the industrial revolution, Empire of Cotton makes a persuasive case that it was the most powerful driver of globalised industrial capitalism – global precisely because of the differing production technologies along the supply chain. Second is the emphasis on the interaction between private interests and the state, and the prevalence of the same kind of argument we still hear from industrialists who talk about the importance of free trade and yet constantly lobby the government to shape taxation, infrastructure, trade rules etc in their interests. The American Civil War prompted much British investment in Indian infrastructure, for example, as cotton manufacturers successfully lobbied for government assistance to create new sources of their raw material. More generally, the book quite rightly underlines the joint innovation of technologies, the organisation of production and trade, and financial and social institutional innovations. So, I agree with some of Beckert’s argument and do recommend reading Empire of Cotton, – but with a large pinch of scepticism. 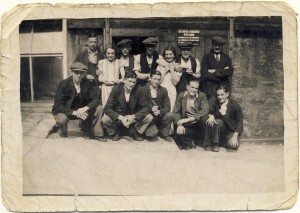 Joseph Coyle (far right, front, aged 14 with his workmates at the Old Ground Mill in Ramsbottom, Lancashire.